Two tutorials down, two to go! This third tutorial will teach you everything you need to know about real-time functions. It's important, so pay attention; here we go! 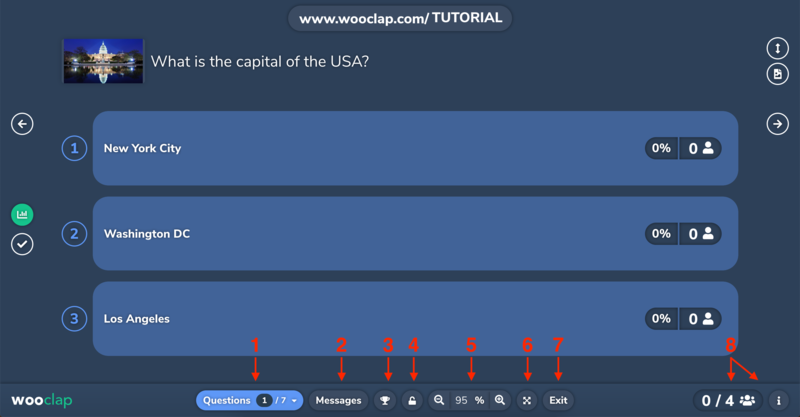 When displaying a question, a presentation, or the message wall, you will find a toolbar at the bottom of your screen. We'll get to that in a second. Let's start with the buttons on the left side and in the top right corner of the screen. and display the title and its image in full-screen. One second later, as promised: the toolbar. The toolbar contains an array of practical functions to use during a presentation or a quizz. 8. In the bottom right corner, you'll find the number of participants to your event and how many of them have answered the current question. Use the adjacent i button to display the rules of participation at any time. That was a lot of information. Take a minute to process it and make sure it all makes sense. I'll wait below. That was quick. Like a "I have read and agree to the terms & conditions" kind of quick. Are you confident you got the necessary information? There's one more tutorial remaining. Are you ready for your final lesson? 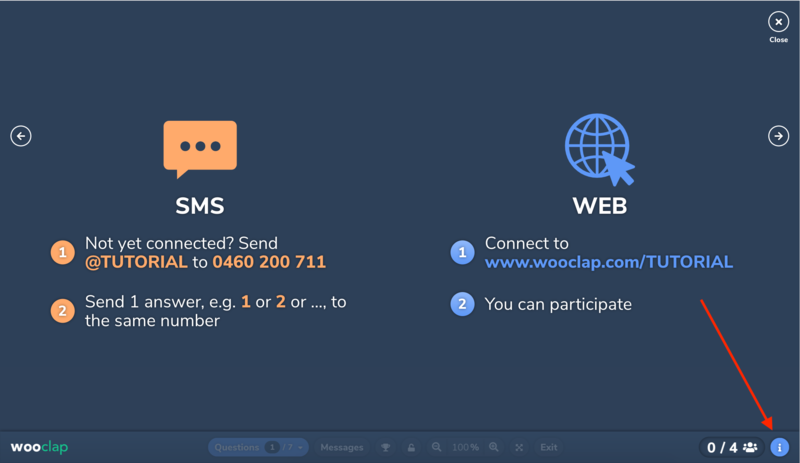 Final Tutorial: Learn to insert questions into a presentation and become a true Wooclap champion!